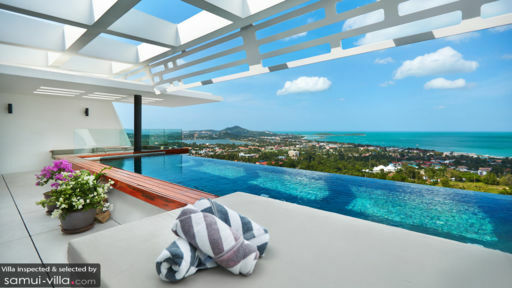 Found in the exciting and serene location of Koh Samui, close to the villages of Choeng Mon, Mae Nam, and Bophut with a gorgeous shoreline depicting sparkling ocean water, Aqua Samui is home to several two- and three-bedroom standard and deluxe private villas. Offering a stay in the lap of luxury, the deluxe, three-bedroom villas are a dream come true with a splendid view of the ocean, luxurious interiors, and private swimming pools! The villa is spread across two floors, while the upper is occupied by the living area and pool, the floor downstairs is comprised of the three bedrooms. The deluxe villas have spacious bedrooms, each with large glass windows overlooking the ocean and surrounding vegetation. The bedrooms are comfortable and are furnished with double beds that ensure a good night’s rest. As you relax in your private space, you can enjoy the quiet and calm of the villa to make sure you get the most out of your stay. Each of the three bedrooms comes with an en-suite bathroom that is fully-fitted with necessary and convenient amenities! The outdoor at both Coral 7 and Coral 9 are marked by a mesmerising panorama of the wide and endless ocean meeting the horizon. As you lounge in the private swimming pool, enjoy an eyeful of the vista and what’s more you always have access to front seats to the sunset! There are pool loungers so you can sunbathe and relax outside in the open air where the fresh air and sunlight will lift your spirits and leave you feeling well-rested and rejuvenated. The A daybed is also found beside the pool, for relaxation and since the pool is connected to the living area, you have easy access to both! 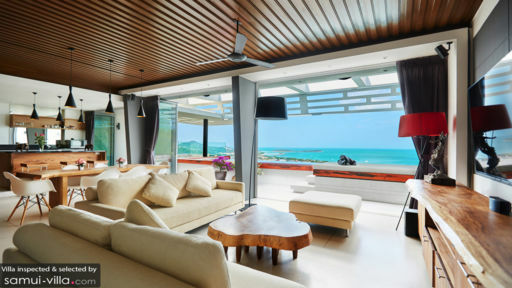 The contemporary interiors of the living area at both the deluxe, luxury villas are offset by pristine, plush white sofas surrounding a hand-carved wooden coffee table for added effect. The living area is instantly relaxing and homely since it caters to all your needs and requirements at the same time. The low-ceiling is similar to wooden ridges that add a cosy ambiance to the room! A flat-screen TV and DVD player is available for your enjoyment, and you can even bask in the glorious view outdoors as you rest on the couch. There is a six-seater dining table in the middle of the living area, again overlooking the scenic beauty of the island, so you have the luxury of relishing a delicious meal all the while gazing at an equally delicious view! A fully-equipped kitchen is part of the living space, so guests can easily whip up something to eat as and when they feel the need. The villa property goes above and beyond the usual to offer an experience that is unlike any other. There are several recreational facilities provided to guests including access to a extensive spa, and the interiors include walkways that inspire and water features that amaze. Housekeeping and management are well looked after by the staff as well! A gym/health club and a restaurant/ bar are expected for the second half of 2018. 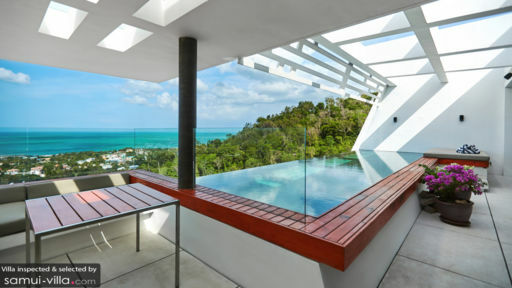 The property is at an ideal location near the famous Chaweng beach and the Gulf of Siam, putting you pleasantly close to the ocean. Head to Mae Nam, Choeng Mon, where you also have the night market, or other nearby places to explore the region with its local fares, street food, and activities!